Olivier is a Mexican journalist who was arbitrarily detained and tortured by police officers in 2006. He spent two years in prison for a crime he did not commit, lost his home and possessions, has been separated from his family and now lives in exile in the United Kingdom. 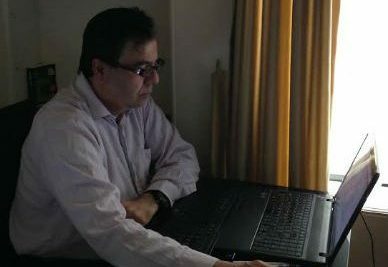 Throughout his career, Olivier published articles critical of the government and corruption in Mexico. As a result he faced harassment from criminal gangs as well as the authorities and eventually he was arbitrarily detained, tortured and charged with a crime which he did not commit. He was imprisoned for two years before being cleared of all charges. He now lives in exile in the UK. From 1995, Olivier was subjected to harassment by the authorities. After receiving threats, he fled to the USA, but returned to Mexico in 1999. He settled in Culiacan (Sinaloa) with his wife and children, where he set up a newspaper. In the first edition of the newspaper he published an article where he denounced the relationship between organised crime and agents of the Ministerial Police of the State of Sinaloa and the Attorney General of the state. Several incidents occurred, in which members of his family, employees, and the clientele of his businesses were harassed; and Olivier and his family received death threats. On 14th January 2006, Olivier was arbitrarily detained by the police near his home. He was tortured for around 16 hours (including being subjected to waterboarding, suffocation, flattening, beatings and death threats). The authorities accused him of being involved with the murder of a young man in the neighbourhood, and that he was hiding a weapon which belonged to the Attorney General’s Office. They took him to the Prosecutor’s Office and forced him to sign a statement. He remained in prison for two years, where he received further death threats and was held for a time in sections of the prison designated for those with mental illnesses. Following his acquittal and release in May 2008, he and his family were subjected to further harassment and threats, and he eventually fled Mexico, and is now living in the UK, separated from his family. His career has been permanently damaged. Nobody has been arrested or punished for the crimes committed against Olivier. Olivier has undergone six expert medical examinations, most of which claim to comply with the Istanbul Protocol but in fact demonstrate serious technical deficiencies. Some of the medical reports were produced by experts working on behalf of the institution accused of perpetrating the torture. The majority of the reports present Olivier in a negative light and deny that he was subjected to torture. A medical report prepared in April 2018 by Dr Pau Pérez-Sales, a leading expert on the preparation of reports compliant with the Istanbul Protocol (the key international standard in the preparation of documentation on torture survivors), concludes that the earlier medical reports lack the necessary objectivity and rigor to be expected in reports of this kind. The report of Dr Pérez-Sales concludes that Olivier continues to suffer a severe post-traumatic stress disorder (PTSD) as a result of his torture. Olivier originally filed a Petition with the IACHR in 2005 (in his own name and that of his wife and children), regarding the harassment he was facing. In 2006, information was added to the Petition regarding the torture Olivier had suffered. After his torture and detention, various legal avenues were explored by Olivier and his family to seek redress before the Mexican courts, but none were effective. REDRESS has been representing Olivier since 2015, and in 2016 submitted arguments to the IACHR about the admissibility of his case. In January 2018, Olivier was informed by the IACHR that, because of the massive delay in progressing his case, the admissibility and merits stages of the case would be joined, and they invited Olivier to submit any additional information. REDRESS assisted Olivier in the preparation of an updated petition which was submitted on 1st May 2018. This took into account some 12 files of papers recently received from the NGO “Article 19” and the Sinaloa Human Rights Commission, containing details of the ill-treatment and the subsequent legal processes in Mexico. Istanbul Protocol: It is the manual outlining the key international guidelines in the investigation and documentation of torture. The Inter-American Court of Human Rights is a judicial institution based in the city of San José, Costa Rica. Together with the Inter-American Commission on Human Rights, it makes up the human rights protection system of the Organization of American States (OAS), which serves to promote and protect human rights in the American hemisphere.